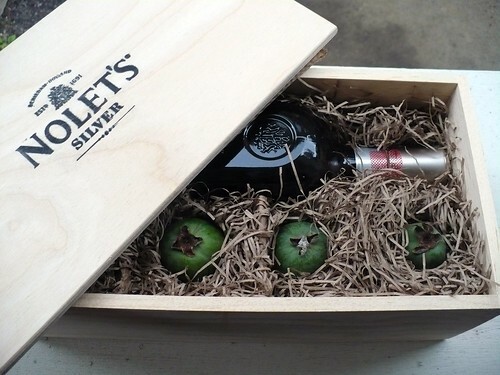 Back in June, I received a lovely package from Nolet’s gin. The company was starting a promotional program they call Garden to Cocktail. The idea is to pair their Silver Dry Gin with a different ingredient each month and use the special ingredient to create new and interesting cocktails. The first ingredient they sent me was feijoa (along with a promotional bottle of the gin, of course), and I must admit, I was stumped. I had never heard of feijoa prior to this. And then I tried the fruit itself. Um … I think the best I can say is, it’s not for me. I didn’t care for either the flavor or the texture, and I was even less sure how to make a cocktail from it. But the gin! Oh, the gin is a different story. Nolet’s Silver Dry Gin is a fairly new product on the market, so you might not be familiar with it. Made by the Dutch Nolet family, it’s the latest recipe from a family who have pursued a 300-year legacy of distilling — first in genever and then, most famously, in vodka. The Nolet family’s Ketel One is perhaps one of the most famous vodka brands in the world, and the family has been able to capitalize on that success by investing resources back into gin. Now, Nolet’s gin is an example of what some people call a new-style gin. That means it’s less reliant on gin’s traditional juniper flavors, pushing the pine qualities of juniper into the background. I have mixed reactions to these newer types of gin. Some brands do this style very well, and others decidedly less so. In thinking about which brands succeed in this style, I’ve decided to pay attention to what flavors they emphasize instead of juniper. Some brands, the ones I like least, do very little instead of juniper. In other words, they don’t really emphasize anything. At best, they have a watered-down gin, and at worst, they have a mislabeled vodka. Nolet takes a different approach, luckily. The family has crafted a gin with a soft, floral, and somewhat fruity flavor profile–the botanical blend includes such unlikely ingredients as rose, peach, and raspberry. In my 5:1 ratio, I found the Nolet to make a delicious martini. Sure, not as juniper-forward as a Tanqueray or Beefeater version, but I’ll be honest: I don’t always want that. The Nolet is round and creamy, and at 95.2 proof, it carries its flavors handsomely into marriage with vermouth. I then tried it mixed “wetter,” at 2 parts gin to 1 part vermouth. I didn’t care for this at all. The gin lost its own character into the vermouth and I felt like I was drinking little of substance. A week later, I tried it again at 5:1 and again loved the martini. So having felt that the feijoa was a dud, but loving the Nolet martini, I was eager to see what awaited me in my second shipment. When this arrived, I opened it to find several lychees. This time, I did get the recipe card that Nolet sent, but again, I didn’t want to just reproduce that cocktail; I wanted to try something different. Also, my wife is nine month’s pregnant and, for that reason, abstaining from booze. Whenever I mix up a fruity cocktail for myself, I like to make her a dry version when I can. So I dug around online and found a Serious Eats post from earlier this year, describing a Lychee Soda at the Modern Bar Room in New York. (Disclaimer: I write for Serious Eats.) That sounded very crisp and refreshing, and I knew it would make Jen a lovely NA drink. So I pureed the lychee, mixed it with some Lavender-Lemon Simple Syrup, from Royal Rose Syrups in Brooklyn (disclaimer: Royal Rose sent me several syrup samples.) Jen’s got topped with seltzer water, whereas mine first got a hit of Nolet’s and then a seltzer blast. Okay, yum. My only complaint is that I’m out of lychees. So I know next to nothing about cocktails (I just found your blog through serious eats and am excited to learn) and maybe someone already suggested it, but some fruits like feijoa are normally blended with milk and sugar to make “juice” in countries where they are habitually consumed (aka South America). Feijoa without dairy doesn`t work very well for me, and I don´t know how you might incorporate dairy into gin (or if you´d even want to) but it´s just a thought, if you ever decide to give feijoa a second chance. While gin has been my spirit of choice since I started drinking spirits, never have I experienced a gin quite so pleasing as Nolet’s Silver. The bottle was given to me by a friend, following a Magellan and New Amsterdam (both of which I now regret quaffing completely within a week), and from the moment I picked up a raspberry scent to sampling the gin itself I have been awe-struck. While a gin could be described as overly-complex, Nolet’s Silver is not. That said, I must and can only describe it as ‘exquisite’ in its complexity. And despite that wonder, it finishes cleanly and cheerfully. This bottle will be savored and stood up against future purchases. It has become my new standard for excellence and I look forward to tasting it again, by various means and with special friends.